Author(s) Wade, Leroy, G.; Simek, Jan, W.
This pack contains 1 copy of Organic Chemistry, Global Edition + 1 printed access card to Modified Mastering Chemistry with eText. Wade & Simek’s 9th Edition of Organic Chemistry presents key principles of organic chemistry in the context of fundamental reasoning and problem solving. Authored to complement how students use a textbook today, new Problem Solving Strategies, Partially Solved Problems, Visual Reaction Guides and Reaction Starbursts encourage students to use the text before class as a primary introduction to organic chemistry as well as a comprehensive study tool for working problems and/or preparing for exams. With unparalleled and highly refined pedagogy, this Ninth edition gives students a contemporary overview of organic principles and the tools for organizing and understanding reaction mechanisms and synthetic organic chemistry. 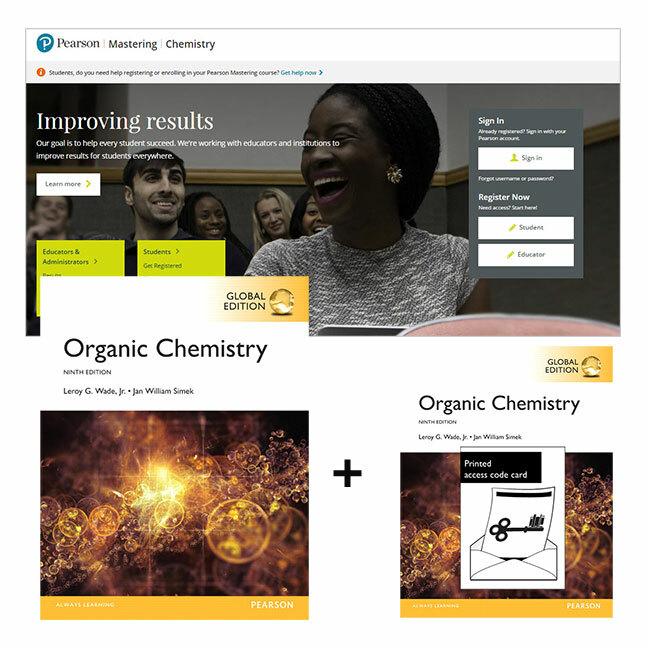 Modified Mastering Chemistry is an online homework, tutorial, and assessment system, designed to improve results by engaging students before, during, and after class with powerful content. Instructors ensure students arrive ready to learn by assigning educationally effective content before class, and encourage critical thinking and retention with in-class resources such as Learning Catalytics™. Modified Mastering Chemistry is not a self-paced technology and should only be purchased when required by an instructor. The duration of access to Modified Mastering Chemistry is set by your instructor for your specific unit of study.